EPA in crisis. Sanity overtakes. Two recent stories underline how the ground is shifting under the Unreliable Energy scam. Big Wind’s lobbyists play their first card when they claim that their projects are welcomed by rural communities everywhere. The events in Michigan are putting an end to that outright lie. The results in Michigan bring the number to ten different states in the US where multiple areas have told Big Wind to blow, so to speak. Big Wind’s worst hiding occurred in Sand Beach, Michigan, where voters approved modifications to local laws that will effectively ban wind development. The vote tally was impressive: 413–80. In another Michigan town, voters who have been smelling the wind so to speak, took planning power away from local councils and directly into voters’ own hands. It was the fear that wind farms might be dropped in on them which precipitated this pre-emptive move. In all, 18 separate townships in Michigan gunned down Big Wind’s expansion plans. Big Wind lost by a margin of 63 to 37 percent. Running out of puff, so to speak. Kevon Martis, the organiser for want of a better word, of this wind resistance said that the big turbine companies had spent half a million bucks against about $400 by the opponents. “If wind energy is so great, why didn’t the county voters choose to have more of them?” he said, pretty effectively summing up the common world wide feeling. Why is it so hard to sell such an wonderful thing as Unreliable Energy? The biggest question is that if Unreliable Energy is bloody marvellous how come it has to be subsidised? How come it is so expensive? How come it inflates electrical energy prices everywhere on earth that it is used? How come when the citizens tell Big Wind to fade away, they take to the courts to force the citizens to accept the blessings of Unreliable Energy. Big Wind – and believe me they are BIG because one mob made a profit of half a billion and paid not one cent in tax – gets where they are with the free and powerful assistance of government’s environmental agencies. Any government. Here, in the UK, France, Spain… The government spends our money helping them to impose their product on us. Under the cloak of ‘saving the environment’, government agencies pillory, frustrate, block, and prosecute all efforts to use coal and oil as the source of cheap reliable energy. In this crusade they are served and encouraged and helped by the grubby remnants of what once was a sane press. But having seen how easy it is to tyrannise people in such a noble cause, these environmental agencies – wherever they are, remember, Australia, NZ, US, UK, take the big stick to ANY mining venture. A kind of war against the periodic table of elements. Mining, you see, digs a big hole in Mother Earth. But in our second straw in the wind, the US Trump-instructed environmental agency, the EPA, the other day settled a lawsuit and simultaneously quashed a long-running campaign against a mining company.. The EPA ended the war with the Pebble Limited Partnership, a massive copper and gold mine in Alaska’s Bristol Bay region, signalling to industry leaders how Trump’s EPA will function. But while the EPA has dropped the lawsuit, it makes it clear that a mining company – or anyone else – will not be given open slather to do what it likes. “The agreement will not guarantee or prejudge a particular outcome,but will provide Pebble a fair process for their permit application and help steer EPA away from costly and time-consuming litigation,” the official statement read. Put another way, the EPA announced that from now on that it would, you know, start following the rules. Maybe that sounds boring but it is a radical departure from Obama-era operating procedure. 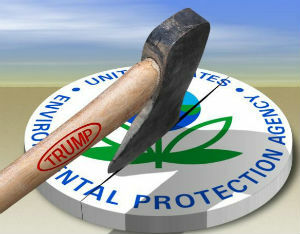 In its usual despotic way, and affected by Mad Environmental Syndrome (MES), Obama’s EPA had simply issued a preemptive veto of the proposed mining project. The EPA never even gave the company a chance to make its case. Something like 15,000 jobs and $180 million annually in taxes, stayed in the ground as a result. EPA bureaucrats weren’t just ignoring the law, they were coordinating with anti-mine groups to kill the mine. Months before getting involved officially, the EPA was secretly trading emails with Alaskan tribes to coordinate the opposition. In one particular email, one lawyer asked the EPA for “suggestions, revisions or edits” they could make to a petition asking the EPA to kill the mine. Something like our own Human Rights mob that goes huckstering in the public media asking if anyone would like to bring a case against anyone else. Well, worse really, we don’t have anyone even vaguely like a political leader to tell Human Rights to pull its head in. Here is a terrific resource regarding the WIND POWER SCAM………..
Heard on radio this morning talk that nuclear or thorium should be up for discussion instead of politicians hiding under the bed like scared boobies when the issue is raised. However, I wouldn’t expect much to come from this idea as the media are almost totally senseless when it comes to wind farms, emissions and such like, so any discussion on the subject of sensible energy would be vetoed. Add to them a cowardly PM, a contradictory and utterly stupid green party to which can now safely be added both Labor and the Libs and Australia can look forward to energy prices we cannot afford and blackouts when the wind goes missing. every one will need to invest in a generator , increased Insurance as all the blackouts will ruin refrigeration of food…..We have the Government of stupids. When the Green Dream is achieved and only millionaires can afford to switch on the light I will simply go back sixty or so years and revert to cooking on a wood fired stove, boiling up the copper to do my washing and using old Hurricane Lamps for night light. If we all did likewise that would leave the windmill proponents blowing wind up their own skirts.